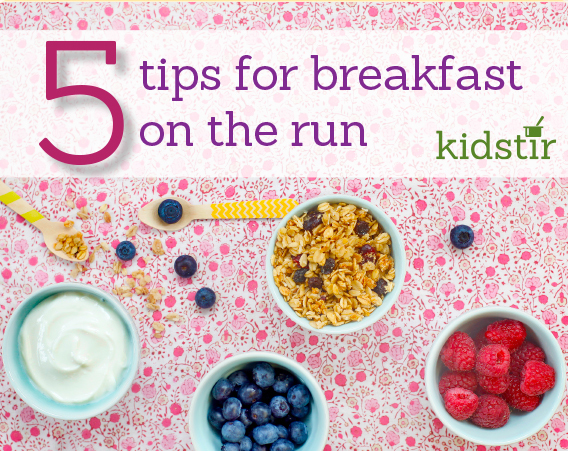 In the rush to get out the door in the morning, it might be easy to skip breakfast. But be sure to make time for the most important meal of the day. Here are some tips for quick meals on the run. On a weekend day, mix up some crunchy granola so that you have plenty of cereal for the week ahead. Set out a buffet with fresh berries and yogurt or milk. Let the kids help themselves to a bowl of cereal and fruit, or build their own breakfast sundaes. If your kids don’t have time to sit down for a bowl of cereal, mix up a smoothie with bananas, fruit, and juice or milk. For a yummy healthy recipe, try our Green Dragon smoothie. Pour the smoothie into a travel mug and they can sip up some nutrition on the go. Slice up an apple into rounds. Spread one apple round with a little nut butter and top it with a spoonful of cereal or granola. Top with a second apple round and enjoy your apple sandwich! While your bread is toasting, cut up an avocado, following our easy tips. Spread it on the toast and top it with a sprinkle of salt. You can also add a tablespoon of pomegranate seeds. For a protein-packed breakfast, fry up an egg and top it with a little cheese. Then place it the middle of a toasted english muffin. Add fresh snipped herbs, a slice of tomato, and salt and pepper to taste. Wrap it up and eat on the way to school.